“Reducing Dementia Caregiver Stress: Focus on Mindful Meditation” was presented by Heather Stang at the Western Maryland Alzheimer’s Association Dementia Conference on November 10, 2015 at Mt. St. Mary’s Conference Center in Frederick, MD. You may be familiar by now with the physical, emotional and psychological stress that are the unfortunate side-effects of caring for a loved one with dementia. As if the pain of someone dear to you wasn’t difficult enough, your own body and mind may begin to suffer as you use your own precious resources to care for them. Left unchecked, this constant exposure to the stress response known as fight-or-flight can compromise your health. The good news is that the practice of mindfulness meditation can actually reverse the negative impact of stress on your body, cultivate more compassion for yourself and others, and even shrink your amygdala – the fear center of your brain. Preliminary research indicates that people who care for family members with Alzheimer’s disease and other dementias in the home experienced a decrease in perceived stress and mood disturbance when practicing Mindfulness-based Stress Reduction (MBSR) (Brown, 2015). Another trial indicates that MBSR was “more effective at improving overall mental health, reducing stress, and decreasing depression” than those who only participated in a caregiver education and support (CCES) intervention (Whitebird, 2012). The goal of mindfulness is to find liberation and reduce suffering by training your mind to respond, rather than react, to your experiences. Mindfulness techniques can be practiced formally (seated meditation, walking meditation) or informally (awareness breaks, mindfully engaging in day to day tasks, mindful communication). Mindfulness is not “zoning out,” “day dreaming,” or “relaxation,” though it can be relaxing once you learn to control your reaction to your thoughts. You don’t have to clear your mind, or have a particular set of spiritual or religious beliefs. Find a comfortable position; your eyes can be closed or with a soft focus on a point in front of you. Set your intention for your practice (to cultivate patience, to get a break, to better your health). Take 3 full in and out breaths, then return to a natural breath. When you feel your attention is steady, let go of these “subtitles” and experience your breath just as it is, being aware that you are aware. In place of breath, you can also focus on any of your senses – sight, sound, taste, touch/sensation, smell, and even thoughts/cognitions. When you find that you are no longer paying attention to your breath – or other object of focus – just begin again. Catching yourself and bringing yourself back is what Sharon Salzberg calls the “magic moment in meditation.” This is the practice – leaving the present and bringing yourself back again and again. If a difficult emotion arises, practice the RAIN technique outlined below. When your time is complete, consider the possibility of carrying this mindful awareness with you throughout the day. Recognize – Acknowledge what you are feeling. Ask yourself, “What is happening inside me right now?” You can gently label it non-judgmentally: Fear, fear. Sadness, sadness. Frustration, frustration. Allowing (Acceptance) – Be willing to be present to your experience, no matter how unpleasant. Whatever you notice, let it be. (Tara Brach recommends noting “I consent” or “yes” or “this too”). Non-Identification – Recognize you are not this emotion or experience; it is just a temporary event arising, and eventually it will be gone too. Watch the emotion with an attitude of natural presence. *Compassion First! If the difficult emotion is too overwhelming, you can always come back to your breath. It is called practice – not performance! You will get distracted. A lot. This is normal. I cannot stress this enough. The most important thing is that you start over and over and over as often as you need to – with a gentle and kind attitude to yourself. Regular practice for shorter intervals is better that one BIG practice each week. Start with 5-10 minutes 3 times a week, and work your way up to 10-20 minutes 5 days a week. Try it for 8 weeks. And then for the rest of your life. Use a kitchen timer, your phone or an app such as the Insight Meditation Timer so you do not have to keep opening your eyes. Commit to practice the whole time! Incorporate informal awareness breaks into your day. Stop and take a deep breath, or feel your hands on the steering wheel. Actually taste the food you put in your mouth. Find a task you do every day, and try to approach it mindfully. Even a few seconds can help your body interrupt the fight-or-flight response and bring you more peace and health. Try walking meditation. With your eyes open, pay attention to your feet as they hit the floor. So often we are stuck in our heads – this gives you the chance to notice the rest of your body, which creates more space in this moment. Brown, K. W., Coogle, C. L., & Wegelin, J. (2015). A pilot randomized controlled trial of mindfulness-based stress reduction for caregivers of family members with dementia. 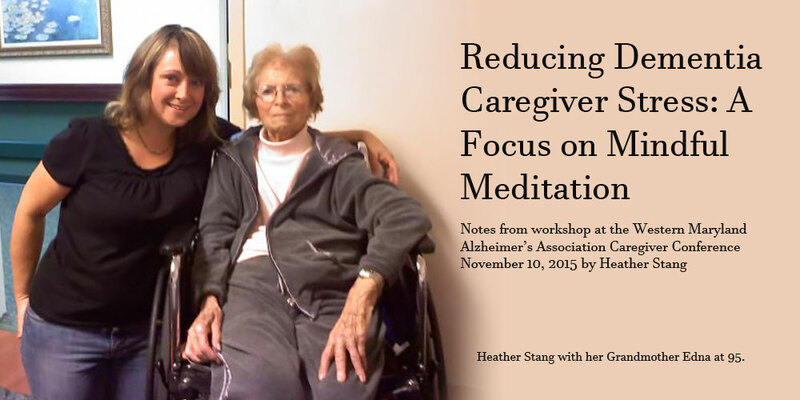 Aging & mental health, 1-10. Stang, H. (2014). Mindfulness and grief: With guided meditations to calm your mind and restore your spirit. CICO Books: London. Whitebird, R. R., Kreitzer, M., Crain, A. L., Lewis, B. A., Hanson, L. R., & Enstad, C. J. (2013). 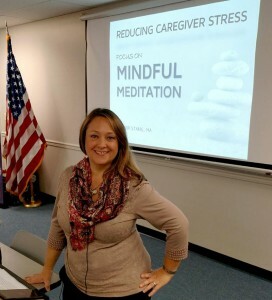 Mindfulness-based stress reduction for family caregivers: a randomized controlled trial. The Gerontologist, 53(4), 676-686.